The validation of complex simulation models is a challenging task. To increase the trust into the model, diverse simulation experiments are executed to explore the behavior of the model and to check its plausibility. 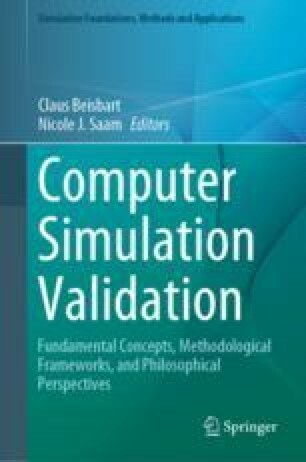 Thus, these simulation experiments present an important information about the validity of the model, similarly as the data used for calibration, as input for the model, and for testing its predictiveness. Simulation models are rarely developed from scratch but by reusing existing models, e.g., by extending or composing them, or for cross-validation. These models and their validity provide further details about the validity of a model. Thus, a multitude of artifacts contribute intricately related to the final simulation model and our “gut feelings” about it. To make these artifacts and their relations explicit and accessible, we will apply a declarative formal modeling language, a declarative language for specifying and executing diverse simulation experiments, and a provenance model to relate the diverse artifacts in telling the validation tale of an agent-based migration model. This research was supported by the German Research Foundation (DFG) via research grant UH-66/15 and research grant UH-66/18. Klabunde, A., Zinn, S., Willekens, F., & Leuchter, M. (2016). Multistate modeling extended by behavioral rules (Version 6). https://www.openabm.org/model/5146/version/6/view. Sheppard,C. J.,& Railsback, S. (2015). Time Extension for NetLogo (Version 1.2) [Software]. https://github.com/colinsheppard/time.